Back in 1973, Congress passed the first enactment of the Endangered Species Act. While there had been a couple of other versions before 1973, this is the one which brought real protection and gave the U.S. Fish and Wildlife Service a way to designate species as endangered or threatened. This allowed for ways to protect and manage these species and their habitats for the betterment of themselves and for Man. However, while this posts celebrates a day of wisdom and foresight of Congress and the people of the Unitied States back then and today. The places where animals and plants are not endangered or threatened use the term management very loosely when it comes to a couple of species: wolves and harp seals. One killed because of a precieved threat and one for its fur. Really, is anything a threat to mankind other than itself? Do we need to kill any animal for fur? Why are Alaskan Wolves Under Siege? I guess wolves are so plentiful and dangerous in Alaska as to allow the use of snares and poison gas in and around the dens of the pups. It’s not enough to chase wolves to exhaustion using airplanes and then kill them with high powered rifles? Wolves might take a few trophy caribou, moose or deer from hunters they say. I suggest if you think that to read Farley Mowat’s account of studying wolves in his book, Never Cry Wolf. For wolves are no match for healthy prey and must rely on the weak and infirm to stay alive. This is nature’s way of keeping healthy and viable populations in the wild. Harp Seals are beautiful creatures and are no threat to overfishing the waters in the Atlantic Maritimes of Canada. They are also owners of warm and highly sought after fur. The annual “hunt” is brutal and inhuman and unneccesary. I understand management principles in wildlife biology. I studied them when I went to the College of Envionmental Science & Foresty in Syracuse, New York, where I earned my degree in Forest Biology and Wildlfe Management. These two species, the wolf and the harp seal, are not being “managed” but are being used for the sport of killing and for greed. Both are unacceptable and unneeded in the 21st Century. To help stop these and other atrocities against wildlife, I ask you to support such organizations like the National Wildlife Federation, World Wildlife Fund and Defenders of Wildlife. Happy Endangered Species Day! This entry was posted in Animals and tagged alaska, canada, endangered, harp seal, help, hunt, hunting, mankind, save, species, united states, wildlife, wolf. Bookmark the permalink. Excellent message and photo, too. Did you happen to hear the recent story that Canada’s parliament passed a motion supporting the use of seal products in the Canadian Olympic team’s uniforms for the 2010 Vancouver Games? This is so sad to read. I wonder how big an “industry” we are talking about here and who benefits from it. The seals certainly do not. With the added threat to their habitat from the warming arctic waters, that industry may soon be extinct as well. I am not a hunter (a photograph hunter but not a killer/hunter) but I have been berated up one side and down another when I used a similar argument about wolves on a farmer friend of mine. He went on and on about how many of his lambs were lost to wolves every year. I have noticed that farmers tend to exaggerate, though. As to harp seals…honestly, I have no answer. I want to visit Newfoundland where there is a strong movement to keep the hunt alive. It will be interesting to speak to the hunt and why it goes on. In places where the wolf has been re-introduced in the western Rocky Mountains. The management plan includes protection for farmers and ranchers thru monetary means and removal of any wolf who has been found to take livestock by relocation or traping by federal agents. I understand their concerns and that wolves do roam outside the re-introduction areas. Hunting and trapping is a means to control their population but Alaska and now other states want to hunt them to extinction. This is the first time I’ve visited your site and I’m so glad I stumbled on you – your photos are absolutely beautiful. And thank you for spreading the message of Endangered Species Day. Thank you, Gina. Your blog is very informative and full of interesting articles regarding nature and why it should be protected. The links from your Endangered Species Day postings are great. I’ve added it to my Favorite Blogs list on the right. That is such a beautiful photo of a wolf. I love wolves and coyotes. I wonder when or if humankind will ever truly understand the treasure and wisdom of wildlife and how wildlife is the balance of the Earth. It isn’t the wildlife that is a danger to humankind, it is humankind itself. As modern people, we don’t have to worry about predators. However, predators in nature are important to keep nature’s balance. Some species are becoming nusance ones as they learn to live as suburbs overrun areas which used to be wild. Deer, geese, racoons, skunks, rabbits, coyotes, foxes, snakes, alligators and many other animals are adapting and living close to humans. Thus putting both at peril from deaths by man’s machines or by dieases spread from domestic animals to wild ones and visa versa. As habitat lose increased with human population growth, it gets harder and harder for our wild animals to find homes. Sadly, even our last wilderness places on Earth are being pressured. Many of them are home to the last populations of endangered species. I didn´t know about endangered Species Day, this is such a good idea. Your photo is beautiful. Thanks, Birgitte! 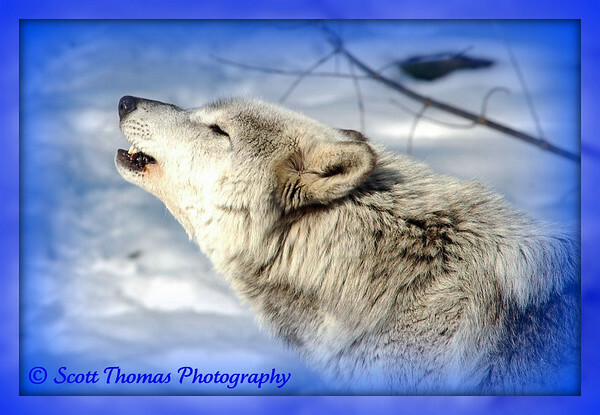 The wolf photo was taken in the Syracuse, NY, zoo and was used in one of my first Views in 2008. At this stage of human evolution, we should be able to find a way of coexist with every other animal species on this planet. But there are still to many of us who don’t think that way. They don’t want to share, they just want to rule. Sad, really sad.